Everyone will suffer: Bloomberg has learned about the reasons for the United States refusing new sanctions against Russia. The Department of State told how the head of the special services of the Russian Federation, who are under sanctions, were able to come to the United States. US forecasts no sanctions not to let designated entities know they are going to be sanctioned, - US State Department. US Mission to OSCE: Crimea-related sanctions on Russia not to be lifted until Ukraine regains control over peninsula. US Territorial Assistant Secretary of State Esper visited the Center for Peacekeeping and Security in Lviv Region. Poltorak traveled to the United States with a working visit, the Ministry of Defense. In Russia, a teacher was dismissed, who complained to Medvedev on salary. Private military companies of Russia recruit volunteers from the local population to engage in battles in Syria on the Donbas. 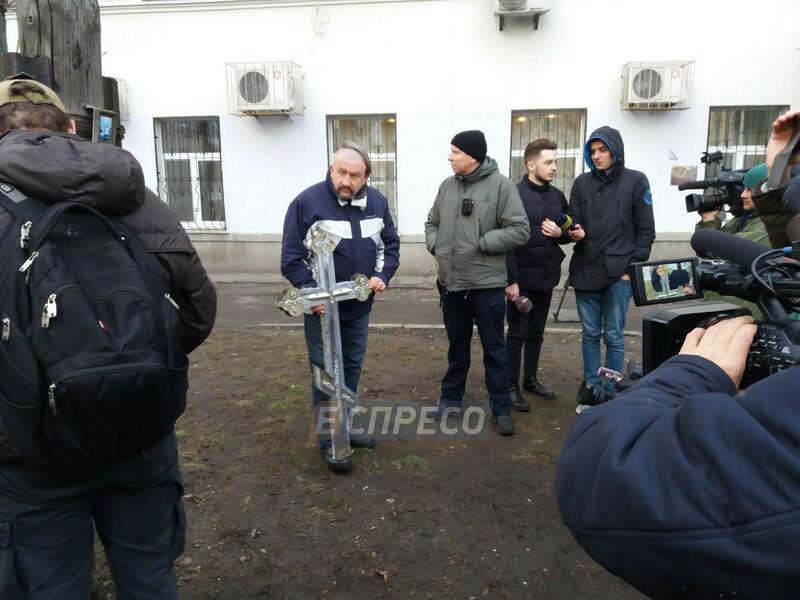 In the center of Kiev, the cross of the Moscow Patriarchate was dismantled. Pentagon: US aircraft will continue to fly over the Black Sea. IT Entrepreneur John Sung has sold billions of businesses in the US and is developing a startup in Kyiv: "I See Potential in Ukraine". Membership of Ukraine and Georgia in NATO is possible in the face of Russia. United States sanctions on Russia's sovereign debt could have a negative impact on the world economy. This is stated in the report of the US Treasury Department, which was at the disposal of the agency Bloomberg. In particular, the document states that the expansion of sanctions against sovereign debt and derivatives of the Russian Federation could destabilize the markets and spread beyond Russia, caused "negative side effects on world financial markets and business". Congress requested a report on the implications of potential sanctions against Russia's sovereign debt under the law called "Countering Americans through the Sanctions Act" (CAATSA), which was adopted last summer. This report was sent to Congress on Monday, January 29, but its details became known only now. It is noted that foreign investors hold more than a third of Russian government bonds. So, BlackRock Inc., Stone Harbor Investment Partners and JPMorgan Chase & Co are the largest holders of Russian bonds for a total of $4.9 billion. The report says that sanctions against the sovereign debt market will put pressure on economic growth in the Russian Federation, increasing the burden on the banking sector, which could lead to Russia's response to US interests. "It is noted that the consequences of new American sanctions may be felt Investors and businesses themselves, both in Russia and in the USA. The United States suspended one category of sanctions against Russian intelligence chiefs so they could come to Washington to negotiate with their American counterparts. This was announced by the head of the State Department's Press Service Heather Noyert. This refers to the recent visit to Washington by heads of the Foreign Intelligence Service (SZR) of Russia Sergey Naryshkin and the FSB Alexander Bortnikov, as well as Igor Korobov, Chief of the General Directorate of the General Staff of the Armed Forces of the Russian Federation. "I can say in general that if any issue is considered appropriate to the American interests of national security, then we have the ability to cancel it, so that people have the opportunity to come to the United States," Neuert said. "It's no secret that, despite the many differences with the Russian government, we also have areas in which we must work together, and one of them is the fight against terrorism and the ID. I will stop there, besides, I have nothing for you no ", - added the employee of the State Dept. However, she refused to provide details of entry to the United States of designated Russian officials, stressing that the disclosure of visa decisions prohibits the current legislation. "I can say the following, knowing that this issue is annoying for many journalists: we can not discuss requests for visas and similar things. This information is considered private in accordance with federal law. Do you like this or not, such a law, and therefore we must adhere to it, "concluded Heather Noyert. The fact that the U.S. did not impose sanctions on Jan. 29 should not be interpreted as evidence that they will not be imposed in the future. Spokesperson for the U.S. Department of State Heather Nauert told a briefing on thursday, Feb. 1, Censor.NET reports. "January 29th... was not a deadline to impose new sanctions on Russia. It was the first day under which we had the authority under CAATSA to impose sanctions if we made the determination that some sanctionable activity had taken place. There is currently no end date to that authority. "Now, you all know we do not forecast sanctions because that lets those entities know that we are going to sanction them, and that can cause them to change their behavior, flee the country, things of that sort. There is no end date to this authority. The fact that we did not impose sanctions on the very first day that we had authority should by no means be interpreted as evidence that we will not impose sanctions in the future," Nauert said. As reported, the list of 114 Russian politicians and 96 "oligarchs" who have flourished during the reign of President Vladimir Putin fulfilling a demand by Congress that the U.S. punish Moscow for interfering in the 2016 U.S. election was released late Jan. 29. The list was made public along with the Trump administration's surprising announcement that it had decided not to punish anybody - for now - under new sanctions retaliating for the election-meddling. Some U.S. lawmakers accused President Trump of giving Russia a free pass, fueling further questions about whether the president is unwilling to confront America's Cold War foe. Late July 2017, the U.S. Senate passed the new sanctions bill against Russia overwhelmingly and sent it to Trump for signature. Russia in response restricted U.S. diplomatic missions' access to several facilities and demanded to shorten the staff of the mission by 755 people by Sept. 1. Trump signed the new bill on Russia sanctions into law on Aug. 2, but in a signing statement, he said he sees serious flaws in this document, although signs it for the sake of the national unity. Acting Deputy Chief of U.S. Mission to the OSCE Michele Siders says sanctions imposed against Russia over Crimea will remain in place until Russia returns full control of the peninsula to Ukraine. As reported by Censor.NET, she said delivering her speech to the OSCE Permanent Council in Vienna, Austria, on Feb. 1. "United States fully supports Ukraine’s sovereignty, independence, and territorial integrity within its internationally-recognized borders. We seek the safety and security of all Ukrainians, regardless of language, religion or ethnicity. We do not, nor will we ever, recognize Russia’s occupation and purported annexation of Crimea. Crimea-related sanctions on Russia will remain in place until Russia returns full control of the peninsula to Ukraine," Siders told the OSCE Chairperson-in-Office Angelino Alfano. She also said that Russian occupation authorities‎ continued to harass and persecute Crimean Tatar activists with impunity. According to her, the ongoing raids on Tatar homes and villages this week resulted in several more activists arrested on trumped-up charges. The U.S. diplomat reiterated that America joined its European and other partners in restating that the sanctions against Russia for its aggression in eastern Ukraine will remain until Russia fully implements its commitments under the Minsk agreements. "Colleagues, each week in this Council, we hear from the Russian Federation that this conflict is tantamount to a so-called Ukrainian “civil war.” We all know the truth – the brutal war in Donbas is fomented and perpetuated by Russia. If Russia truly wants a peaceful resolution of this conflict, it will stop undercutting Ukraine’s sovereignty and territorial integrity," she said. Today, February 2, the International Center for Peacekeeping and Security in Lviv region, visited an American delegation headed by US Secretary of State Marc Esperom. Tsensor.NET informs about it, referring to the press service of the Lviv Regional State Administration. Representatives of the delegation got acquainted with the peculiarities of organizing the training of military personnel under the leadership of foreign and Ukrainian instructors. Great interest in foreign guests was caused by the Center for simulation training of the Training Center for Unit Preparation. In particular, they got acquainted with its purpose and capabilities, the battalion and brigade tactical operational centers (TECs), as well as the virtual simulation of the VBS3 team. Minister of Defense of Ukraine Stepan Poltorak has started a working visit to the USA. He will take part in bilateral defense consultations. According to the press service of the Ministry of Defense of Ukraine , Tsensor.NET reports.
" Within the framework of the visit, the Defense Minister of Ukraine, Army General of Ukraine Stepan Poltorak will take part in bilateral defense consultations of the country's departments, meet with US Secretary of Defense James Mattheys, representatives of the leadership of the US Defense Department, as well as the command and officers of the operational and strategic level of the US National Military College" , - said in a message. Poltorak will also meet with volunteers who assist the Ukrainian army and journalists. In Russian Taganrog, a teacher from the city metallurgical college was released, who complained to the head of the Russian government, Dmitry Medvedev, on salaries of teachers. According to Censor.NET, February 2 Radio Liberty reports. In his complaint, Makarenko said that approved in 2016, the salary of 8289 rubles is not different from that received by Russian specialists in 2012. He demanded to explain why the salary of teachers, which is so several times lower than the average level in the region, has not been indexed for four years. According to the 161.ru portal, in the Russian Ministry of General and Vocational Education, they said that Viktor Makarenko, who had worked in the technical school for 40 years, was fired for "disciplinary offenses", not because he wrote a letter to Medvedev. At the temporarily occupied territory of Donbass, the recruiting centers of Russian private military companies have intensified their work. As informs Tsensor.NET, this was stated at a briefing by the representative of the Ministry of Defense of Ukraine on ATO Dmitry Gutsulyak. According to the Ukrainian intelligence, the so-called "volunteers" from the local population, as well as from unions and parts of the so-called 1 and 2 of the AK-Russian occupation troops for further deployment to participate in hostilities in Syria in March of this year. "The selected personnel goes to the collection points in the Rostov region for the purpose of their pre-training and distribution, with priority given to those who already have experience of combat operations in eastern Ukraine. Recruiters during campaigning campaigns carefully hide from potential candidates numerous cases of non-fulfillment by private military companies of contract terms , failure to pay proper money to the families of the dead and return their bodies to their homeland", - said Gutsulyak. Lieutenant General McKenzie commented on the situation with the interception of an American aircraft by a Russian fighter. The United States will continue reconnaissance flights over the Black Sea, despite the "dangerous and unprofessional" interception of American aircraft by Russian aircraft, on February 1, the Director of the Joint Chiefs of Staff Lt. Gen. Kenneth McKenzie, said on February 2, " Voice of America." "The airspace over the Black Sea is international, we have the right to be there, and such flights will continue," Director-General of the Joint Chiefs of Staff Lt. Gen. Kenneth McKenzie said on Thursday, speaking to journalists. He commented on the recent situation with the interception of an American reconnaissance aircraft over the Black Sea and the statement of Moscow, which recommended the United States in the future to refrain from such flights. US Navy forces in Europe reported that last Monday, the Russian Su-27 aircraft approached the American aircraft EP-3 at a distance of one and a half meters and crossed the road just before his nose. Russian media referring to the Russian Ministry of Defense, for their part, reported that the Russian Su-27 fighter on Monday captured an American reconnaissance aircraft over the Black Sea. Specifies that the airplane E-3E Aries II Navy did not violate the borders of Russian airspace. After the US Navy reconnaissance aircraft changed its flight course from the Russian territory, the Su-27 returned to the base of the airfield, media reported. General McKenzie called Russia's actions "dangerous and unprofessional". Earlier, the US expressed "the worst concern" due to the dangerous convergence of the Russian military aircraft and American aircraft in the international airspace over the Black Sea. "Although the American aircraft acted within the framework of international law, the Russian side grossly violated existing treaties and international law," said State Department spokeswoman Heather Noerth. "This is just another example of Russian military action that ignores international norms and agreements," she added. However, representatives of the Ministry of Defense of Russia told reporters that the maneuvers of the Russian fighter were standard, absolutely lawful and safe. "Aerospace forces will continue to provide reliable protection of the frontiers of the airspace of the Russian Federation.If for American pilots aware of this fact is the cause of depression and phobias, we recommend the US side in the future to exclude routes such flights near Russian borders or to return to the negotiating table and agree on rules their execution", - quotes TASS statement of representatives of the department. IT Entrepreneur John Sung has sold billions of businesses in the US and is developing a startup in Kyiv: "I See Potential in Ukraine"
American businessman John Sung sold his company Five9 to San Francisco with a capitalization of $ 1.4 billion in the United States and moved to Kiev to develop a startup for automating sales and marketing with JetBridge, along with a Ukrainian partner. According to Tsensor.NET, an American spoke in an interview with the publication MC Today. Speaking about the reasons for the move, he notes that Ukraine has "freedom and diversity" in contrast to California and Western Europe, where "you can not speak openly about your thoughts and opinions and should carefully select each word." In addition, John Sung claims. that information about the terrible war that is spreading in Western media is exaggerated. "Americans think that in Ukraine it is dangerous, there is war, corruption and everything is bad, so this year I will definitely bring American venture capitalists to Kyiv, show them Unit City and Kiev, which is not inferior to Budapest, Lisbon or Warsaw," he said. - he says. John Sung also notes that although young Ukrainians have the potential, they lack Western experience. "I see potential in Ukraine and I think that Kiev will become the next Berlin. There are many young and intelligent IT engineers, marketers, product managers, designers and talented graduates of universities in Ukraine, but for the global success Ukrainians need to take over the experience of Western companies. year I'm driving my team to Silicon Valley, where they communicate with colleagues from Google and Facebook, venture capitalists and successful entrepreneurs, and if once they leave my company and decide to run their business, they will have direct revenue up to people from the Silicon Valley and they will not have to start from scratch, "says the American businessman. He underlines, however, that unlike the US, the startup-revolition in Ukraine is only gaining momentum. "I came to the Kremlin Valley 15 years ago, when the startup culture did not exist, and their projects were launched by desperate and risky people, it was the beginning of the revolution. Now, the same revolution is taking place in Ukraine, and I am happy to stand at its origins," he said. - says John Sung. NATO membership for Georgia, and later for Ukraine, is convinced by Director of the Center for Foreign Policy Research Heritage Foundation Luke Coffey. According to Tsensor. NET , referring to Voice of America, in his opinion, Georgia meets NATO requirements, and its cooperation with the transatlantic alliance is extremely active. The problem is that Georgia's accession to NATO can automatically mean a war with Russia through the occupied territories. "Today Russia's policy in Georgia and Ukraine is to keep these countries out of the EU and NATO, they think that the illegal occupation of parts of these countries is the best way to prevent them from joining the EU and NATO, but we must remove it," he said. Luke Coffey. In order to lift these reservations, Coffey proposes to amend article 6 of the NATO statute, which defines which territories fall under Article 5, and temporarily exclude the territories occupied by Russia from the scope of the requirements of joint defense. "This sends a very powerful signal to Moscow that only because you somewhere intervened - in Crimea, Eastern Ukraine, Tskhinvali, Abkhazia or Transnistria - only because you illegally occupied the territory of this country, this will not stop the progress of this country in convergence with the Euro-Atlantic community, which will not stop its transatlantic integration, "said Coffey. Luke Coffey believes that these actions, albeit difficult, will deprive Russia of the motivation to aggression and occupation of territories of other countries. This is reported by Espresso .TV. 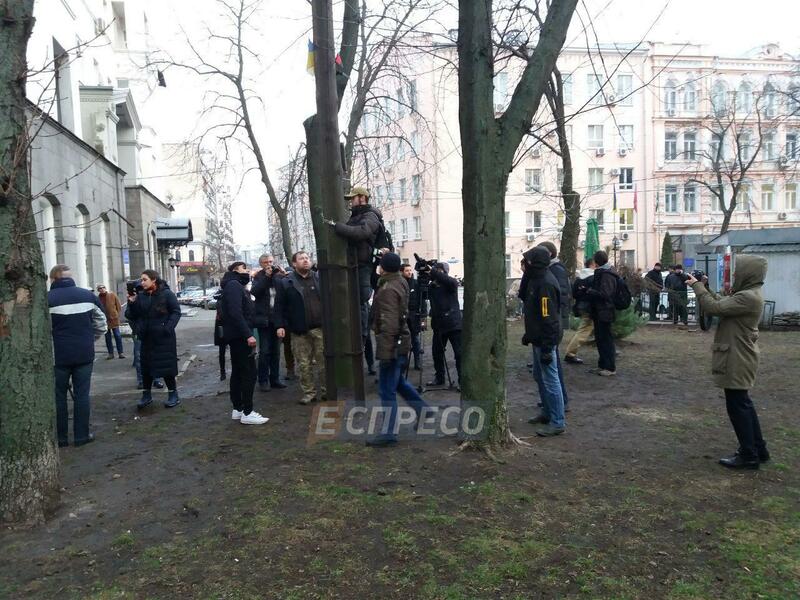 The cross was erected on the street Zolotovoritskaya, opposite the building of the State Border Guard Service. It should be noted that the main building of the SBU is located near this place. Activists believe that the cross was established illegally, and if you do not pay attention to this situation, then the next MFA of Moscow Patriarchate will soon appear on this site. They also refer to the words of representatives of the Kiev authorities, for which such structures are illegal. Tomorrow, February 3, the activists promise to begin dismantling the Moscow Patriarchate's Moscow Patriarchate at the Desyatinny. -On January 25, the nationalists of the organizations "С-14", "Traditions and order" and "Falcon" tried to set fire to the Moscow Patriarchate. -Men were caught, they were chosen as a preventive measure in the form of a 60-day arrest, with an alternative to making a deposit in the amount of 2.2 million hryvnia. -KSCA is ready to remove from the Desyatinn all illegal architectural forms , except for the "chapel" that was built on the territory of the Museum of Ukrainian History.